Matching Dragoons: Jonah Hex #2 Vol 1 "The Lair of the Parrot"
Jonah Hex #2 Vol 1 "The Lair of the Parrot"
"The Lair of the Parrot"
Wyandott, Texas, a small town on the Mexican border marks a turning point in the saga of Jonah Hex. Hex had pretty much been a "done in one" type guy except for a few story arcs here & there (The Point Pyhrrus story, the Fort Charlotte Massacre with Mr. Turnbull, the two stories with Joe Bigfoot). For the most part you read a Hex story & not really need to read any of the others to get the flavor of the man. I'm not sure what initaied or allowed the change to an ongoing story line. I'm assuming that since Jonah had his own book, DC was trying to increase sales. Anyway, the story begins with Jonah minding his own business in a bar in Wyandott. A store owner leads Sherifff Baxter and two deputies into the bar & accuses Jonah of holding up his store. Baxter tells Jonah to unhook his gunbelt and come along quietly. Jonah tells the sheriff that he just got into town 15 minutes ago and then "Tiny", the deputy punches Jonah in the face, punches him in the gut, breaks a chair over his head and then drags him out of the bar & into the jail. Jonah gets awakened in jail with a bucket of cold water and is surrounded by Baxter, his two deputies and Ned Landon, a special agent for the U.S. Secret Service. Landon explains that a Mexican bandit leader, El Papagayo, is holed up in the canyons around Villa Rojo. For three years his band has been robbing everything in sight and has convinced the Mexican people that he is interested in overthrowing President Porfirio Diaz . The US has to stop him, but can't do it openly. Landon wants Hex to join El Papyago's gang, learn what his plans are and then report back. Hex will be taking two cases of "the U.S.Army's most modern repeating rifles" to sell to the bandit. Landon will put out a story that the rifles were stolen, lending credence to Hex's story. Hex takes the job, telling Landon to keep the $10 g's warm. After Jonah leaves, Landon walks back into the sheriff's office and thanks everyone for their help, pulls a pistol and shoots all three of the men dead. Quietly walking out into the night, Landon tips his hat & leaves. Ten days later, the buckboard that Landon gave Jonah is winding it's way through the Villa Rojo canyon. Two of El Papyago's guards spy the buckboard & fill the driver with lead. Running down the canyon they discover that all they shot was Jonah's clothes tuffed with straw & Jonah is standing behind them in his longjohns, both guns drawn. Shortly thereafter, Jonah drives the buckboard right into the camp of El Papagayo. Papagayo congratulates Jonah for finding his hideout without developing "lead poisoning". Jonah mentions that he had good guides and uncovers the two guards who are under the tarp in the back of the buckboard. The guards start pleading with the bandit, saying that they were tricked. Papagayo admits that everyone makes mistakes and then shoots the first guard, stating that he must save his bullets for the upcoming revolution, he knifes the other guard in the chest. Papagayo turns his attention to Jonah and questions why Jonah is there. Jonah breaks open a case of rifles, Winchester 74's, and tells Papagayo that he will sell them for $5 each. Papagayo mentions that is a good price, but Jonah has forgotten that he is surrounded by men. 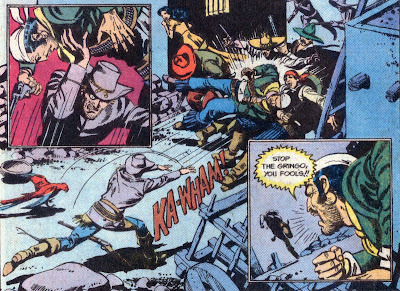 Papagayo orders his men to kill Jonah, but Hex quickly draws and guns down four men before they can return his fire. Papagayo has the dead men dragged away and then says that he & Hex can deal over dinner since the bandit is ready to pay $4 for each rifle. Jonah corrects Papagayo and says that he was asking for $7.50 from the start. Stab the bandit guarding the horses. Check! Steal the first horse he can find. Check! Jump the horse over a nearby canyon while everyone shoots at him. Check! Hex decides he needs to speak with Landon regarding those missing firing pins, so he heads back to Wyandott Texas. About a week later, Jonah is riding back into town and everyone is whispering about how crazy he is to come back. Jonah goes to the sheriff's office & asks where Sheriff Baxter is. The new sheriff is holding Jonah at gunpoint and tells Jonah to remove his guns, he is wanted for the murder of Baxter & the two deputies. Suddenly a lynch mob bursts through the front door and Jonah, seeing the writing on the wall, jumps through a window, grabs his horse and rides out of town under a volley of gunfire. It's not for several hours that Jonah can stop and water his horse, but when he does he tries to figure out how to track down Landon. The epilogue shows Landon riding up to a broken down barn. He walks into the darkened barn. A voice in the dark asks if the plan worked. Landon reports that it did, that hex bought everything, including the part about the Secret Service. The voice tells Landon that he has served his purpose and a gunshot drops Landon to the ground, dead. The last panel hints at the identity of the plots mastermind. Since Ned Landon states that he came all the way from Washington, that means that this story does NOT take place between 1870 & 1874, when the Secret Service HQ was located in New York City. The mention of President Diaz would place this between November of 1876 & Nov of 1880, or between Nov 1884 & 1911. 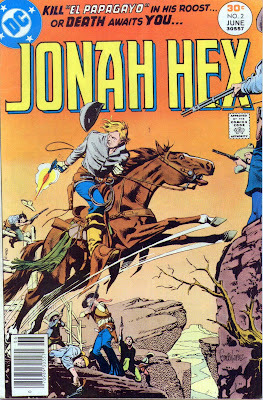 The later rule of Diaz would too late for this to be a Jonah hex tale, so we will place this between 1876 & 1880 (until we find out more later). There is also the reference to Winchester '74s, presumable made in 1874 ,the '76 would have been the newest rifle available when Diaz was president. We can only assume that the DC universe was starting to deviate from our real history by this point. This is another great story from Fleisher & Lopez with the beginning of an arc that will last for several issues. Introducing El Papagayo in a way that showed the bandit as ruthless was very well done. One real surprise this issue was a letter from Fred G Hembeck. I kid you not! Next Week: The blind leading the blind & them damn pacifists!!! This is a great story..as usual. Poor Jonah ALWAYS gets screwed. I'm not surprised by the Fred Hembeck letter. I was reading an old Green Lantern, by Steve Englehart, and it had a letter from Beau Smith!